(Nintendo Wii, 2010). New sealed. Never opened. Game in box w/ manual, great shape. Your game is shipped to you within hours in a bubble mailer via first class mail. If you want this shipped in a box then order it to be sent expedited and it will be sent in a priority mail box. Always check feedback before buying on Ebay or Halfcom! When comparing listings if the product description doesn't specifically say box and manual are included then its likely NOT included so keep that in mind when choosing who to buy from. Since I am in the USA everything I sell is made to play in the USA NTSC format. I do not sell imports or PAL games. 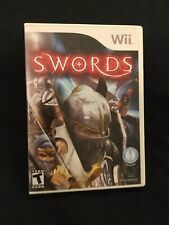 Plays on Nintendo Wii and compatible systems such as Wii U! Hard to find especially in this condition. Tested in good working condition! Complete with manual Free shipping within the U.S.
ESRB Descriptor Violence. Players can sharpen their skills and learn important new combos through training challenges in which they learn carving, sparring, and blocking, and they can then put all of their skills into action by battling a horde of zombies. The case has wear/scratches and sticker/residue. Includes the manual. The disc has lite scuffing/scratches. Play tested. 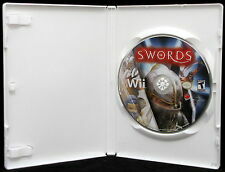 Swords (Nintendo Wii, 2010, Teen) Complete !!! Sealed, never opened, never played. Rated Teen for violence.